My divorced aunt did not work while she was raising eight children. After her former husband died, she was pleasantly surprised to learn she could start collecting his Social Security. She has a lot of company. Nearly two out of three men and women in a new survey by RAND were unaware of this rule: a divorced person who was married for at least 10 years is entitled to the deceased spouses’s survivor benefit. In fact, she would even get the benefit if he remarried. In the case of couples who were still married when the spouse died, the marriage had to last only nine months for the survivor to get the benefit. Fewer than half of the people surveyed by the RAND researchers were aware of this rule. The responses were no more impressive for some of the other questions about Social Security’s survivor benefit. This benefit is based on the higher-earning spouse’s work record – typically the husband. Even a wife who used to work and is collecting Social Security based on her work record is eligible to switch to her husband’s benefit after he dies – if his check is larger than hers. Unmarried partners sometimes operate under a misconception too: three out of four think, incorrectly, either that unmarried people can get the survivor benefit, or they don’t know. One thing to note about this study is that Americans of all ages were surveyed, and it is not surprising that young adults would have little knowledge of program benefits intended for widows. But age doesn’t seem to bring wisdom: the results were equally dismal in a similar earlier survey of individuals who were at least 50 years old. The perils of aging generally escalate around 75, and they are becoming more pervasive as more Americans live to very old ages. One of these perils – declining cognitive ability – often creates financial problems. A new study that summarized the research on this side of the retirement equation identified the financial fallout from dementia. Currently, dementia afflicts roughly a quarter of seniors in their early 80s. And geriatricians and demographers have predicted for years that dementia will become a serious societal problem in the future as the tsunami of baby boomers reach older ages. The first sign of deteriorating financial skills might be forgetting to pay a bill. But when severe dementia sets in, the vast majority completely lose their ability to manage their finances and risk making big mistakes, such as losing money in a fraudulent investment scheme. Another concern is retirees’ growing reliance on 401(k)s for more of their income. Increasingly, they are grappling with the complicated question of how much money to withdraw each year from their 401(k) accounts – this is difficult for anyone but virtually impossible for people with dementia. Fortunately, most of them get assistance managing their finances. But the seniors who don’t get help face potentially grave repercussions, such as having difficulty affording food, housing and medical care. 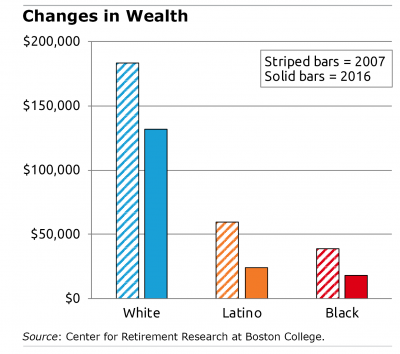 Racial differences in workers’ finances are nothing less than shocking: whites have roughly six times more wealth than Latinos and black-Americans and double the income. These age-old disparities will be as familiar to readers as they are to economists. But a clear and updated picture of their magnitude was presented in a recent study. 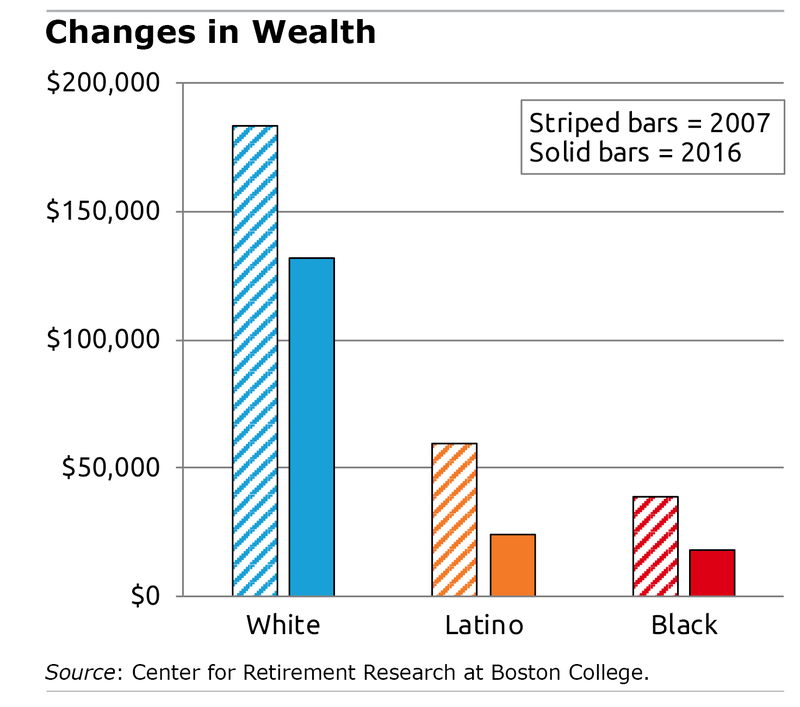 In 2016, U.S. household wealth, regardless of race, still had not rebounded to 2007 levels. But whites made a lot more progress climbing out of the hole created by the plunging stock market and housing crash that ushered in the 2008 recession. The researchers examined changes in each group’s net worth over a decade. Pre-recession, white households had five times more wealth than blacks; this ratio grew to 7-to-1 in 2016. The white-Latino wealth ratio doubled from 3-to-1 to nearly 6-to-1. The 2016 data are the most recent from the Federal Reserve’s triennial survey of American households’ personal finances. The earnings picture isn’t as dire but the gap is still large. 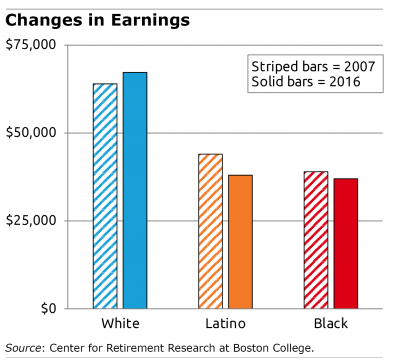 White households are earning slightly more than they did in 2007, and blacks and Latinos are not. In 2016, white Americans had two times more income than either minority group. Amid a growing awareness that many Americans aren’t properly prepared for retirement, various efforts have ramped up to push the non-savers to save. A notable initiative is occurring in state government. California, Illinois, and Oregon have started IRA savings programs that require private employers to offer the state-sponsored IRAs to workers if the company doesn’t already have a 401(k). Cell phone apps are also popping up to make saving easier. One such app – Finhabits – is being marketed directly to Latinos, who financial experts say are particularly unprepared for retirement. Two out of three Latino workers aren’t saving in a retirement plan, often because they work in low-wage restaurant and hotel jobs that don’t offer one. 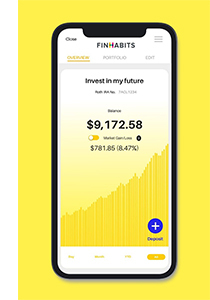 The Finhabits app offers both traditional and Roth IRAs, which can also be set up online. 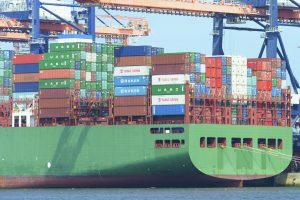 The IRA regularly deducts an amount, designated by the customer, from his bank account and invests the money in low-cost exchange-traded index funds managed by Vanguard or BlackRock. “We are rapidly approaching the point where we will simply be unable to afford medical care,” says Dr. Edward Hoffer. This is no exaggeration, according to the Henry J. Kaiser Family Foundation: health insurance deductibles and copayments are rising so fast that a significant share of working families have great difficulty paying for their care. 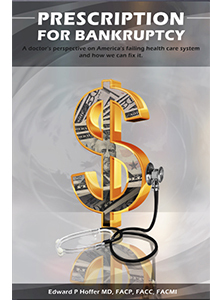 His book, “Prescription for Bankruptcy,” provides his insider’s view of why healthcare costs keep going up. 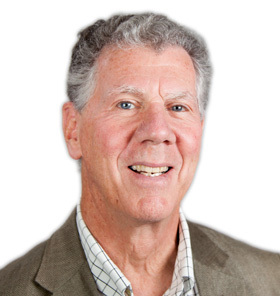 For 46 years, he has worked in Massachusetts as a cardiologist, public health official, and hospital and private practice administrator. Question: How do U.S. medical costs compare with other countries? Dr. Hoffer: The U.S. spends roughly twice as much per capita on healthcare as most other countries. Switzerland is nowhere near us, and they’re more expensive than the rest of Europe. Canada, Germany, France – they all have excellent healthcare systems and spend about half per capita what we do. Q: What does this have to do with patient care? In April, Trudy Schuett will have a procedure to save a tooth, which she estimates a dentist would charge $3,000 to $5,000 to do. But Schuett, who lacks dental insurance, will pay about $1,000, because the procedure will be performed by dental students at Midwestern University Clinics in Glendale, Arizona. Her cleanings at the school are affordable too. Regular clinic visits have saved “buckets of money,” she said. She is one of those resourceful retirees who always finds a way. 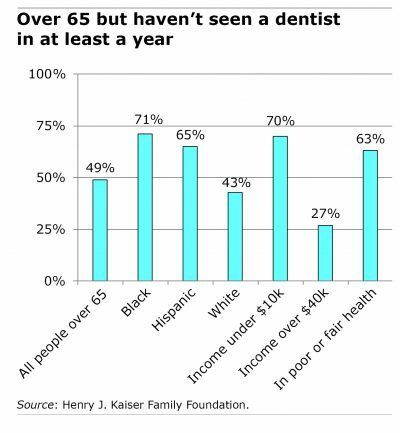 But two out of three people over 65 do not have dental insurance, according to the Henry J. Kaiser Foundation, often because they lose the coverage when they leave their employer. Medicare does not pay for routine dental expenses, though it sometimes covers care for medical procedures considered integral to a retiree’s health, such as jaw reconstruction or heart surgery; some Medicare Advantage plans offer dental insurance. But retirees who lack dental insurance are often forced to forgo care or limit their visits to the dentist. 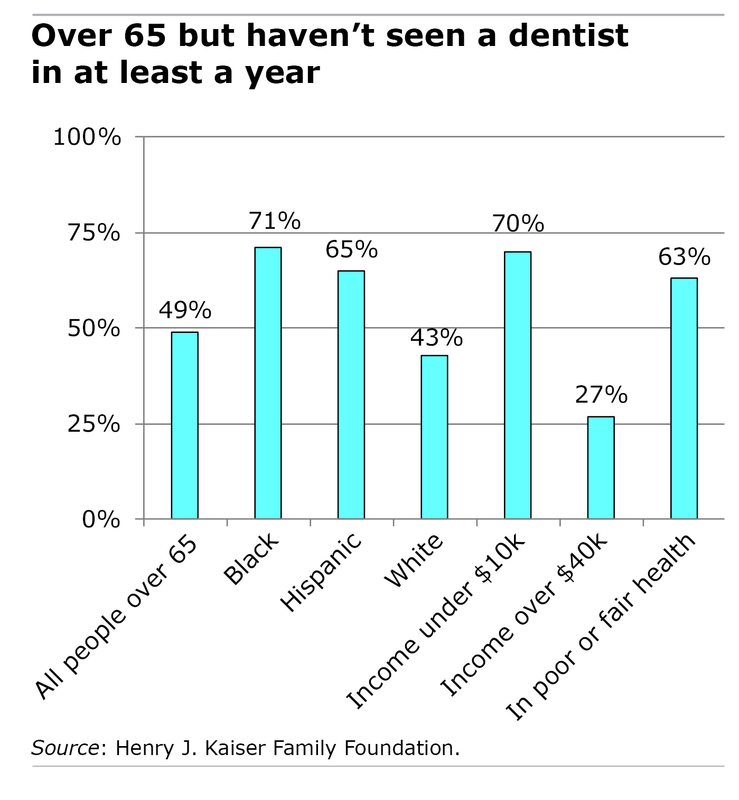 Half of seniors haven’t been to a dentist in over a year, Kaiser said. When they do see a dentist, they spend an average $922 out of pocket. For the half of Medicare beneficiaries trying to live on $26,200 or less, dental care consumes, at minimum, 3.5 percent of their income. Poor dental care also causes health problems. Dry mouth, a side effect of some medications, can cause teeth to loosen or fall out. Tooth loss makes it more difficult to eat. For a variety of reasons, 15 percent of retirees have lost all of their natural teeth – in West Virginia, a low-income state, 30 percent of retirees have no teeth, Kaiser said.